His administration swore up and down that Iran was just doing a solid for our sailors and Marines, whose boats, we are told, had apparently broken down. Obama's spokesman said the capture and detention of American servicemen and servicewomen were exactly why we had to lift sanctions on Iran and bless its enrichment of uranium. His surrogates whispered to media allies that rather than provoking the Iranians to attack the U.S., Obama's nuclear deal really made it possible for the U.S. to free its captured personnel who never should have been in Iranian custody in the first place. The Obama administration gave us its word that Iran had no "hostile intent when it captured ten Americans, forced their surrender at gunpoint, and then demanded an American apology for the whole affair. And then Iran released these photos of the nine men and one woman who were arrested at sea by the Iranians. The Iranian humiliation of Barack Obama is now complete. Operation Whatever-The-Farsi-Word-Is-For-BOHICA was a success. This was no friendly maritime assist from an American ally. It was a coordinated public relations coup from a violent regime that wished to humiliate the very president who in just days will bless the transfer of tens of billions of dollars to the terrorists in charge of Iran's government. None of it was true. Our military personnel were captured, forced to surrender on their knees, and photographed. Their images were then broadcast to the world on Wednesday morning by the Iranian regime, a clear violation of the Geneva Conventions. The American woman who was captured was forced to submit to Islamic law and don a hijab. State-run Iranian media announced that the whole affair was meant to be a "lesson" to "troublemakers" in the U.S. Congress. The Iranians have this man pegged. They know he's so desperate for a deal, any deal, to bless Iran's enrichment of uranium and transfer billions to its terrorist-funding government, that he will say and do anything to make sure it happens. Iran knows how desperately this man craves a deal. He will stop at nothing to make sure it happens. Iran knows this. So how does Iran respond? By declaring "Death to America." By conducting forbidden tests of nuclear-capable ballistic missiles. By capturing American military personnel, holding them at gunpoint, forcing them onto their knees, blindfolding them, and parading their visages all over TV for all the world to see. Iran does this because Iran knows that at this point in his presidency, a nuclear deal is far more important to Barack Obama than anything else. So Iran will inflict one last humiliation upon the man before extracting $100 billion from him four days from now. It wasn't enough to make him bow down. Iran wanted Obama on his knees. Iran wanted him and the country he governs humiliated before a global audience. Unfortunately, Iran got exactly what it wanted. The Iranian humiliation of Barack Obama is now complete. Photo is a direct result of the endless fecklessness and capitulation of an incompetent president who sees American weakness as a feature and American strength as a bug. As President Barack Obama delivered his final State of the Union Address Tuesday night, 10 members of the U.S. Navy were being held by the Iranian Revolutionary Guard. Iran seized two U.S. Navy boats, after they allegedly broke down and drifted into Iranian territorial waters. Obama declined to mention them, or four other Americans being held by Iran. The U.S. sailors were released the next day, and the Obama administration apologized for the intrusion. Obama did congratulate himself for the shaky Iran deal. "As we speak, Iran has rolled back its nuclear program, shipped out its uranium stockpile, and the world has avoided another war," Obama boasted. Except Iranian missile tests have already shown the deal is worthless. The latest provocation undercut a bizarre bit of chest-thumping in the middle of Obama's otherwise flat speech. "The United States of America is the most powerful nation on Earth. Period. It's not even close," Obama said. But such power is useless in the hands of a President unwilling or unable to wield it properly. Obama excused more aggression from a rogue nation that shouldn't get the benefit of the doubt. Iran pulled the same stunt in 2007, capturing a British naval vessel in international waters, and holding its crew for 13 days. Iran's provocative actions tested the Obama administration's resolve. The test has come back negative. There's no point pretending the illegal seizure and release of America's sailors is anything other a huge propaganda victory for Iran - and a humiliation for the United States. Insofar as there was a strategic calculation behind Obama's outreach to the mullahs, it was that the nuclear deal and the lifting of sanctions would incentivize the Islamic Republic to start behaving like any other house-trained member of the community of nations. In other words, they'd stop pulling this stuff. As it was, Joe Biden and John Kerry could not resist bragging that the swift resolution of this situation was testament to the new hunky-dory Washington-Teheran relationship. They released them, like ordinary nations would do. That's the way nations should deal with one another. That's why it's important to have channels open. I'm appreciative for the quick and appropriate response of the Iranian authorities... and I think we can all imagine how a similar situation might have played out three or four years ago. Does that sound familiar? Why, golly, here we are in 2016, and this time round the token US gal was also made to wear a hijab. The Royal Navy guys were put on camera and interviewed about what great hosts the Iranians are - even though forcing your captives to participate in a photo-op is, as I wrote, "a breach of the increasingly one-way Geneva Conventions". Power is only as great as the perception of power. The Iranians understand that they can't beat America or Britain in tank battles or air strikes so they choose other battlefields on which to hit them. That's why the behaviour of the captives gives great cause for concern: There's no point training guys to be tough fighting men of the Royal Marines when you're in a bloody little scrap in Sierra Leone (as they were a couple of years ago) if you allow them to crumple on TV in front of the entire world. "It was a mistake that was our fault and we apologize for our mistake," said the U.S sailor, who was identified by Iran's Press TV as the commander... "The Iranian behavior was fantastic while we were here. We thank you very much for your hospitality and your assistance." I wonder what other videos Iran took. With the British hostages, I recall they mocked one of the lads because he reminded them of Mister Bean. I'm not sure that's specifically mentioned in the Geneva Conventions, but I reiterate my point: The ayatollahs can't - yet - beat our tanks and planes, so they pick battlefields where they can win, very easily. We should know that by now, and train our guys to act accordingly. Six Royal Marines and two Royal Navy sailors were intercepted in Iraqi waters, forcibly escorted to Iranian waters, arrested, paraded on TV blindfold, obliged to confess wrongs and recite apologies, and eventually released. If pictures had been unearthed of some over-zealous Guantanamo guards doing to our plucky young West Midlands jihadi what the Iranian government did on TV to those Royal Marines, two thirds of Fleet Street (including many of my Spectator and Telegraph colleagues) would be frothing non-stop. Instead, they seem to have accepted the British spin that there's been no breach of the Geneva Convention because the Marines and sailors weren't official prisoners of war, just freelance kidnap victims you can have what sport you wish with. Which is marginally less insane than the Biden-Kerry line that illegally seizing foreign sailors, forcing them to their knees and to submit to the dress codes of someone else's religion, using them for propaganda videos and making them issue public apologies testifies to how the new Iranian-American friendship is just peachy and going gangbusters. In fact, the Iranians are doing exactly what they've always done. They got their nuclear deal, and it's business as usual. The only difference is that, a decade ago, they did it to America's allies but they never quite dared to do it to America itself. It's too soon to say how our sailors were treated when they were in the hands of the Iranians who seized them and held them overnight. It's not too soon to say that it is nauseating to watch our state secretary, John Kerry, himself a former sailor, gushing thanks to the Iranian regime, over to which he is preparing to turn more than $100 billion as part the Iran deal. The spin the administration is putting on this incident is one of the most cynical exercises in memory. Yesterday Secretary Carter asserted that the boats "stray[ed] accidentally into Iranian waters due to a navigation error." An IBD editorial raises questions about the purported navigation error, but this is far from the only unanswered question. IBD quotes Christopher Harmer, retired operations commander for the U.S. Navy's Fifth Fleet in Bahrain. Harmer told CNN there was "no reason for a small vessel to be out that far and especially without escorting ships around it," and "the Navy has to explain why you have small ships transiting 300 miles of open ocean." IBD notes that Iran claims the IRGC seized the boats' GPS gear and that it revealed U.S. espionage: "As reported in Defense News, House Armed Services Committee member Duncan Hunter, R-Calif., a Marine who served in the Iraq War, claimed there was no way the Iran military 'didn't reverse engineer, or look at and copy everything that they possibly could' of the two commandeered boats' high-tech equipment." Video released by the Iranians shows the sailors surrendering abjectly on their knees with their hands over their heads. In another video one of the sailors meekly extends his apology for their transgression. "It was a mistake, that was our fault, and we apologize for our mistake," said the sailor, who was identified by the Iranian interviewer as "commander" of the crew detained Tuesday. Seth Lipsky's reservation to the contrary notwithstanding, Aaron MacLean takes up this aspect of the incident in the Washington Free Beacon column "Standard nautical malpractice." The bad news isn't only at the top. There are so many unanswered questions about this incident, not least regarding the uncomfortable fact of one American sailor's on-camera apology to his captors. When I was being trained as a Marine officer in Quantico in 2008, a similar incident had just occurred wherein Iran had taken 15 British naval personnel prisoner for almost two weeks. We studied the affair and I remember having the Armed Forces Code of Conduct, which we had to memorize, stressed by my instructors-who took a dim view of the performance of the Brits. The Code includes passages like "I will never surrender of my own free will." Those boats were sovereign American territory. Were the sailors ordered to give them up? The Code also includes the injunction to "evade answering further questions" beyond the usual name-and-rank stuff, and to "make no oral or written statements disloyal" to the serviceman's country. Regardless of the applicability or terms of the Code of Conduct, the spirit of resistance was conspicuous by its absence. What happened? As Seth writes, it's too soon to answer the question, but it's certainly not to soon to ask. We must insist that question be answered lest the question be suppressed in the service of the Obama administration's continuing abasement of the United States. I think back to the capture of the USS Pueblo. The case of the Pueblo seems to me to provide a useful contrast with the events to which we have just been witness. Because my memory of the events is so vague, I've taken the following accounts from the Wikipedia entries on the Pueblo and on LLoyd Bucher. I've also revisited Steve Hayward's account of the events in the first volume of his Age of Reagan books. While monitoring North Korea on January 23, 1968, the Pueblo came under attack by North Korean naval forces. North Koreans boarded the ship and took her to the port at Wonsan. For the next 11 months, Pueblo Commander Bucher and his crew were held as POWs by the North Koreans. Initially, they were treated relatively well, with good food and living accommodations. However, their treatment turned harsher when the North Koreans realized that crewmen were secretly giving them the finger, which they explained as being a "Hawaiian good luck sign," in staged propaganda photos they had been taking of the crew. From then on they were regularly beaten by the North Koreans. 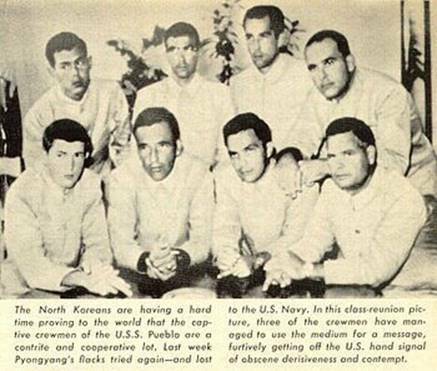 North Korean Propaganda Photograph of prisoners of USS Pueblo. Photo and explanation from the Time Magazine article that blew the Hawaiian Good Luck Sign secret. The soldiers were flipping the middle finger, as way to covertly protest their captivity in North Korea, and the propaganda on their treatment and guilt. The North Koreans for months photographed them without knowing the real meaning of flipping the middle finger, while the sailors explained that the sign meant good luck in Hawaii. Bucher was psychologically tortured such as being put through a mock firing squad in an effort to make him confess. Eventually the Koreans threatened to execute his men in front of him, and Bucher relented and agreed to "confess to his and the crew's transgression." Bucher wrote the confession and the North Koreans verified the meaning of what he wrote, but failed to catch the pun when he said "We paean the North Korean state. We paean their great leader Kim Il Sung." Following an apology, a written admission by the United States that the Pueblo had been spying, and an assurance that the United States would not spy in the future, the North Korean government decided to release the 82 remaining crew members. On December 23,1968, the crew was taken by buses to the demilitarized zone (DMZ) border with South Korea and ordered to walk south across the "Bridge of No Return." Exactly 11 months after being taken prisoner, Bucher led the long line of crewmen, followed at the end by the Executive Officer, Lieutenant Ed Murphy, the last man across the bridge. The United States then retracted the ransom admission, apology, and assurance. Following his release, Bucher was subjected to a court of inquiry by the Navy for having given up the Pueblo without a fight (as Steve Hayward notes at pages 181-182 of the first of his Age of Reagan books.) A court martial was recommended. Secretary of the Navy John Chafee then intervened on Bucher's behalf to foreclose action against him. Bucher seems to have followed orders not to start any international incidents. Bucher continued his Navy career until retirement in the rank of Commander. The Pueblo, incidentally, remains in the hands of North Korea.